Coke or Pepsi? PlayStation or Xbox? Cash games or tournaments? These are the head-scratchers that have ignited debate around the world for years. With the soda and game console scenarios, it’s clear which are winners. But if you love to play online poker, you might actually enjoy both. Cash games and tournaments are two different breeds of poker games. Which one do you prefer? Which one could turn your newfound poker strategy into big money? Today, we’re uncovering all of the differences in our in-depth poker cash strategy vs. poker tournament strategy guide. Ready to play online poker? Before you implement a poker tournament strategy or a poker cash strategy, you need to understand the differences in the tables. 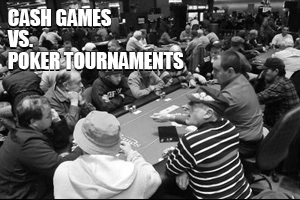 Cash games primarily occur at just one table. You sit down and you remain at that table until you decide to leave or until you no longer have money in play (assuming you don’t want to re-buy). In a tournament, you’re playing at one of many tables and you can be moved from one table to another as the tournament field gets smaller. Tables are consolidated as the tournament progresses so that the balance remains fair throughout the game for all players. If you’re the type of poker player who wants a bit of freedom, cash games are perfect. You can jump in and out of one whenever you please. There’s essentially no beginning and no end to the game, as long as players are waiting to play. In tournaments, you need to play until the end if you want a shot at winning cash. Many tournaments come with late registration, so you can sit down to play after the initial start time. But there’s always a cutoff, so make sure you sit down in time. When you sit down at a cash table, you buy in. If you buy in for $25, you are given $25 in chips. The chips have an exact cash value, so when you decide to leave the table, your chip stack is worth exactly that in cash. In tournaments, however, you are given a set stack of chips for a set prize pool. For example, a $50 buy-in tournament and a $5 buy-in tournament might offer the same 5000-chip starting stack. These chips have no cash value. Instead, you are playing to win the tournament and be the last man standing. Each tournament features a prize pool that gets distributed to a specified number of players. For example, the prize pool might be valued at $1,000, with first place taking $350, 2nd place taking $200, 3rd place taking $75, and so on. You’ll earn cash based on where you finished. In cash games, there is no prize distribution. Your chip stack is worth cash. You can walk away from the table at any time and exchange your chip stack for money. In online poker, the money will be reflected in your account the second you leave the table. In cash games, if you bust out, you can buy back in as long as you’ve got the bankroll to cover it. There is no limit to how many times you can sit back down at a table. In tournaments, it’s not the complete opposite. Some tournaments allow you to re-buy or re-enter. So when you bust out, you can come back in by buying back in once again if you like. Many tournaments off rebuys up until the close of late registration. However, some tournaments don’t offer rebuys, so make sure you know what you’re getting into. In tournaments, the blinds go up every level, which could be every 15 minutes, every 5 minutes, or less, depending on the format. Later on in tournaments, antes might also be introduced to speed up the game. This forces players who aren’t blinded in to commit to betting off the bat. In cash games, the blinds are always the same and never increase. Now that we’ve reviewed the differences between cash games and tourneys, it’s important to understand the similarities between the two, especially if you want to implement a poker strategy at the tables. First and foremost are the rules. Whether you’re playing a Texas Hold’em cash game or a Texas Hold’em tournament, the rules of the game are identical (with the exception of increasing blinds and antes, of course). So which one wins the fight? It’s all about preference and even the top professional poker players jump from cash games to poker tournaments to mix things up. So play around and enjoy.